My wife brought some apples from the supermarket last week as we're getting to the end of the stored apples now. We ate Cox apples until the middle of January and then switch to the King of Pippin (at least I think it is) until now. This apple was terrible off the tree, the skin was so tough you'd be left with it in your mouth after the flesh had gone, we even talked about grafting it over to another variety, but stored for a few months it tastes amazing. They don't look great, in fact I've had a few comments from the guys at work about my "manky" apples - until they tasted them! Then they all wanted to buy a dozen from me. Looks a little like a wrinkly... No don't say it! That's why I was so disappointed when I took a bite into my shiny, juicy, crisp braeburn, expecting an amazing apple. It's certainly crisp and juicy but that's it really. The taste just isn't there, just bland nothingness. A shame that I've got to put up with bought apples until August. This year I'll try to store even more apples (we've still got quite a few cookers left though). Give me a bag of manky apples any day! I'm trying to get all the fencing done this winter so we'll be free to get some stock if we want to later in the year. The only trouble with adding new fencing (besides the cost, effort and time) is removing the old fencing. It's too wet to use a tractor on the field at the moment so I used brute force and ignorance on Saturday afternoon to remove as much as I could. It wasn't easy going as the hedge had grown through it in many places and a lot of it was buried with roots through it as well. I cut and pulled out as much as I could. My main worry with leaving it in was the fact that I'm only fencing one side of this particular hedge. So if an animal gets between the two runs of wire (the old and the new) then they could get trapped and it would be difficult to get them back out, also it's just bad practise to leave it in as you can guaranty that any future work I'd do in the hedge I'd hit some old wire and blunt my tools! Anyone else doing fencing at the moment? I'll make the most of it while it lasts - this little girl loves helping her daddy! The last couple of years I've been planting a few trees in the corner of our "large" 2 acre field with the view to making this into a little coppice for firewood and somewhere for the kids to make dens when they're older. In this little corner there is about 30 native trees, cherry, hazel, sweet chestnut, cherry, etc. But in my fencing frenzy of the last month or so (I'm going to draw up a plan so everyone will know what area I'm on about when I talk about it) I've sectioned off a long strip about 10m wide and 80m long (approx) down the one field to make this coppice area bigger, now needing hundreds of trees. The trouble is what to plant. I want to be able to coppice this on a short rotation if possible and divide it up into sections that will be coppiced each year. I've been reading about hybrid willow and it seems to be the fastest growing tree about that coppices well and is relatively good for firewood and charcoal making. The beauty of growing it like that is the logs only ever reach about 4" in diameter so there is no splitting required. What I want to know is has anyone else had any experience of growing hybrid willow for logs and what does it burn like on a high efficiency wood stove? 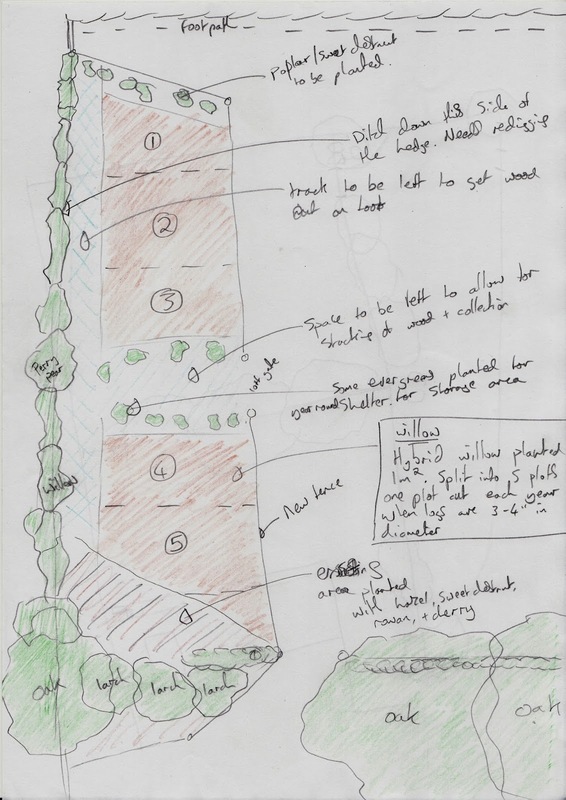 Or should I go for slower growing native trees like sweet chestnut and hazel?